The price of the EpiPen is not the real issue. I do know government action or inaction has a role to play in all this; think FDA. Think the route to generics, think pharmacy advertising and regulation and government mandates. For the full story of the growth of EpiPen and the role government plays, take a look here. I also know most people do not pay the full cost, rather they pay their Rx co-pay (but their plan pays the higher price which is reflected in premiums). The AWP (average wholesale price) is $730.00 (a benchmark, but an amount nobody actually pays). A typical pharmacy pays about $580 wholesale), a bit less for large chains but then chains also receive rebates from the manufacturer based on sales. Rebates are also paid to pharmacy benefit managers (PBMs) all or some of which are passed on to employers or patients (employees in their premiums). The government has a role in rebates too. In this political environment and with the misinformation which abounds about health care, the company made a stupid move that will come back to haunt the industry. Just witness the latest proposal from Clinton. We are singing the same old song; when it comes to health care spending, no amount of our own money is affordable. Look at the story below, the price was okay as long as someone else was paying the bulk of the cost. That $600 they mention is more the result of their high deductible plan. This family was shocked at the price of the pen. I bet they would be shocked at the price of other drugs and health care services too, at least until they meet their family deductible. And have the Henegars factored in the lower monthly premiums they pay because they have a high-deductible plan? Pay now or pay later. They have to replace the injectors every year when they expire. The Henegars remember paying as little as $80 for them five or six years ago before they switched to a high-deductible health plan. “We really noticed it in the past year, year and a half when we went to go have it filled. It was $600,” Lexi said. “When the pharmacist first told you the bill, did you think ‘You must be wrong? '” Nair asked. “I did. I had her look it up again and she didn’t have to because she had answered that question many times with many other people who asked her the same question of, ‘Are you sure that the EpiPen is that expensive — and it is,” Lexi said. But in 2007, Mylan pharmaceutical company won a near-monopoly on the device. The company used its new power to raise the price of EpiPens by more than 400 percent in recent years. Because it could. Now many families will have to make huge sacrifices to scrounge up more than $500 every year. (They expire.) And some children will have to go back to school without this medication because their families can’t afford it. That is unconscionable. “Huge sacrifice.” Why is the $500 a year for the pen any different than $500 for some other expense, because it’s health care related? Is the EpiPen any different than a $500 trip to the ER for people with a high-deductible plan? My daughter just paid $250 for a short office visit. “Families can’t afford it?” What families? Poor families have coverage, most Americans have or should have insurance. What can you think of that families spend $10 a week on that should come after the needed EpiPen? The average American spends $700 a year on the lottery, skewed toward lower-income people. The cost of a dog is between $1300 and $1800 a year and what about smoking or daily designer coffee, etc., etc. Perhaps the EpiPen should cost less than it does, but the political hype and press hysteria is uncalled for and designed only to reinforce the notion that nobody should be forced to spend their own money on health care; any health care, any amount of money. Note: Mylan has announced its intent to sell a generic version of its own product. If so this all may have been a grand marketing ploy. 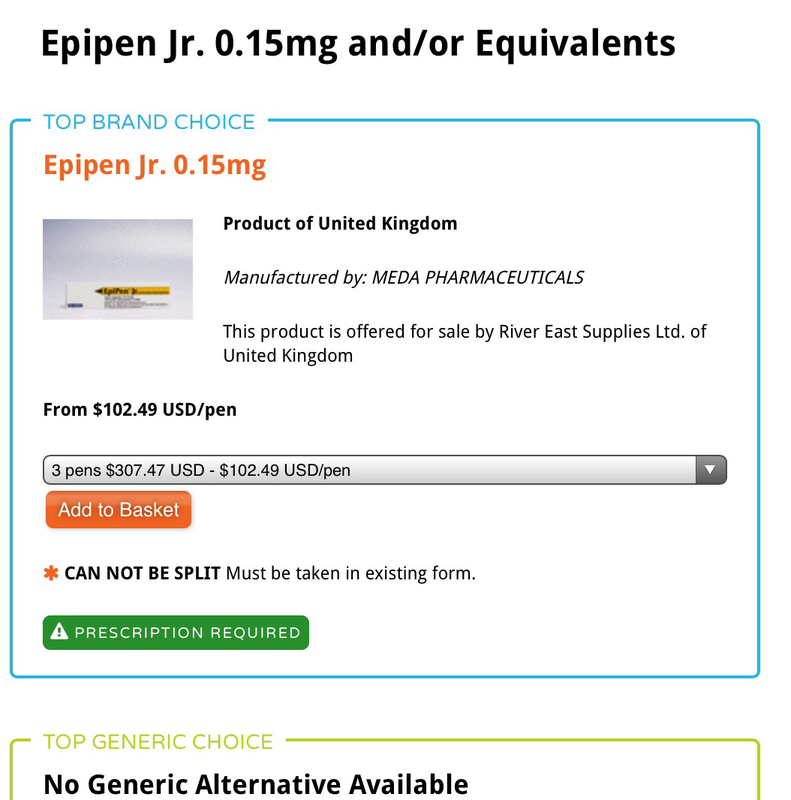 With a generic eventually on the way from competitors, better to get patient focused on Mylan product generic or brand. Big pharma must be closely watched. I’m not talking about closely watched. I have no problem with that. It’s the bureaucracy that inhibits generics and new drugs which is far more cumbersome and lengthy than Europe. In other words thwarts competition. You exaggerate. Yes, some of the press no doubt want single-payer health care run by the government. But that is not what propels this story. What does propel the story is a drug company charging what most people find is far too much. You claim blessed innocence as to “what is a fair price.” Meanwhile acknowledging that the same drug cost a fraction of the U.S. price in Europe. True, drug companies have provided wonderful life saving drugs over the last 50 years. Also true that many of the big ones have also been convicted of conspiring to fix prices with competitors, of evading taxes, and promoting drugs for purposes other than their intended and approved use. Big Pharma has been fined, and paid, hundreds of millions for doing so over the past 20 years. My issue is with the notion that this price is unaffordable simply on its face and that only the apparent greedy company is responsible for the price of the drug or what they can get away with. The lack of competition is caused by our system especially the federal government. As outrageous as the $500/$600 price may be, $10 a week is not a huge financial burden on a family. Furthermore, relatively few families pay that full price in any case. There are many things outrageously priced that we willingly pay for yet attract little attention simply because they are not related to health care. The inefficient system that enables this type of thing and the perception of responsibility for paying for health care are what we need to focus on. The FDA has prevented many substandard drugs from entering the country. Google Ranbaxy, as just one example of an overseas (India) generic drug maker that was prevented by the FDA, finally, from importing drugs into the U.S. because of the appalling conditions in their laboratories and fraudulent record keeping. Worthy of note, to their credit Mylan (of EpiPen fame) has testified before Congress in the past several years to strengthen overseas oversight by the FDA. They want a level playing field. I’m sure the FDA does necessary work, but some things take way too long. Many people point to the cheaper health care in Europe. To get their we need changes if that’s what people want and part of that involves the way they handle drugs. I do not know what a fair price for an EpiPen is. I do not know why prescribed drugs are advertised on TV which raises costs. Innovative drug makers deserved to earn back their R&D cost. What I fail to understand is how these drug prices jump by 600%. Is there a shortage of one an ingredient? Does the ingredient come from only one place in the world control by extremists? What changed? Volume should be making the drug cheaper. I am for free markets, but on the surface it seems like the rules prevent competition and allows the buying out of rival products which looks like pure corporate greed. Corporate greed that effects the health of everybody. When the cost outside the US is so much less you have to really examine what the role is of government in preventing these low prices. If the free market system was working, people would have stopped paying the price after a 300% rise in prices but the true cost is hidden with discounts and kickbacks (rebates) and co-pays. All you know is this is a “must have drug”. If this was truly the case maybe the government should control it and give it away like vaccines. It’s not the ingredient in this case. That’s an old drug that costs about $1.00 what hasn’t been allowed to be generic is the pen itself, the mechanical part that injects the medication. In theory you could just use a syringe for a couple of dollars, but that’s not practical for children or in an emergency. Interesting that the CEO of Mylan is a senators daughter. Anyway, here is a link with another take on why the cost is so high. Think “rent seeking” and government complicity. Exactly what I was saying. Gov’t is part of the problem.